The Sacred Island of Okinoshima has been a ritual site from the 4th – 9th century. Ritual practices and votive offerings were made to pray for safety in navigating the seas, for boats heading to Korea and China to trade. The site includes three nearby islets, Koyajima, Mikadobashira and Tenguiwa, and 4 sites on and closer to Kyushu. There are a number of taboos and restrictions on visiting Okinoshima, including a ban of women and the prohibition “to speak of anything they have seen or heard on the Island”. 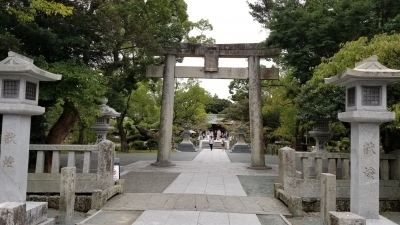 This just deals with the technical side of visiting Hetsu-myia (Munakata Taisha) by public transport from Fukuoka, and combining this visit with the other Unesco site in the region, the Yawata Imperial Steel works in Kitakyushu which is one of the sites of Japan's Meiji Industrial Revolution. Go to Fukuoka Tenjin station that is very centrally located. Look for bus stop 19, close to the big post office building. If you have difficulties to locate the bus stop ask the people at the Tourist Information office, inside Tenjin station, very helpful staff indeed. Their opening time however is 9.30h. 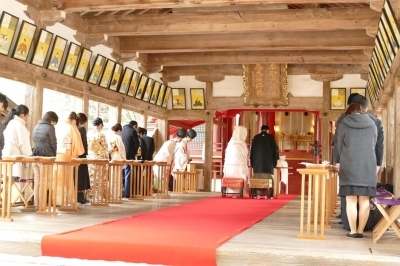 The first bus for the Munakata Taisha temple leaves at 9.00h, followed by two buses at 10.00h and 11.00h, the ride takes 57 minutes, and the bus stop is right in front of the temple. I was lucky to witness the ritual of a traditional wedding where I attach the photo. At 11.01 there is a return bus to Togo station to connect you with a train of the Kagoshima Line that brings you in 36 minutes to the Space World Station where the Yawata Imperial Steel Factory is located. The train leaves from Togo at 11.18, so not much time left to buy the ticket, but if that connection is missed, there is another one at 11.34h. In fact once you are on the main Kagoshima Line, there is plenty of trains going in both directions. Buses from Munakata to Togo Station however are very limited, for instance between 10.00 and 11.00h there is none. After visiting the Steel Factory (in fact you can just make photos from a viewing platform, you get also some brochures, as always in Japan) and there are English speaking guides to answer any questions. The train back to Fukuoka from Space World Station takes about one hour. I left Fukuoka at 9.00h, and was back at 14.30h, ready for the Fukuoka Tower and the City Museum. I visited 3 out of the 8 inscribed components of this site on a day trip in early December, namely Hetsu-miya on Kyushu, and Nakatsu-miya and Okitsu-miya Yohaisho both on Oshima. I of course could not visit the main attraction of this site and its attendant islands. As for the tombs I found them to be a hassle to reach and so skipped those. There are a few direct buses to Hetsu-miya from Fukuoka, and the first one of these on Saturdays (maybe on Sundays too but I did not check on that since I made the visit on a Saturday) goes all the way to the Konominato Port from where the ferry to Oshima can be taken. 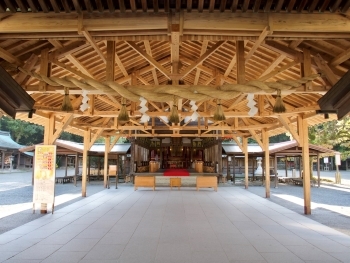 Nakatsu-miya has an associated shrine all the way up on the summit of Mt Mitake. Although this is merely a hill a little over 200 m tall, it was still quite a lung-imploding and leg-vein-exploding climb for unfit me. The reward at the top is a little shrine and a lovely view of Kyushu and much of the very green island itself. 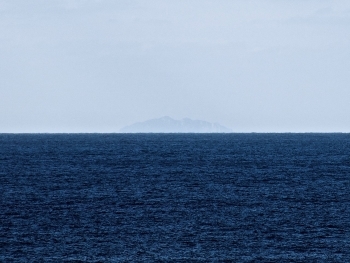 If the weather is clear, the island of Okinoshima can also be spotted if one knows where to look. The best place on the island to try to spot Okinoshima however is probably at the back of Okitsu-miya Yohaisho. After all, this shrine was built precisely for people to worship the sacred island without actually having to be there. The shrine therefore appeared to be empty (it was closed but I could peek inside) except for a window which opened out to the sea and in the direction of the sacred island. Okinoshima was of course not immediately visible, but after straining my eyes a little I finally spotted it. I have to say that the shrines are nothing visually spectacular, especially since I had been in Kyoto and Nara not long before this visit. Nevertheless, the whole trip was somewhat of an adventure for me, particularly on Oshima. I really did enjoy walking through the forests and being very much alone there. Surprisingly there were not too many visitors to the island even though it was a Saturday. Okinoshima AND RELATED SITES was just recently added to her UNESCO stable. As many already know, going to Okinoshima is not possible for but a few males and even now they are dicussing about making this sacred island visitor-free forever. One needs to understand that these sites were inscribed for cultural reasons and the untouched nature on Okinoshima is impossible to observe. The other destinations are, however, not difficult to see. Question is if they are worth it though. For the regular Joe tourist there is absolutely nothing special to see. They are Shinto shrines like you see in many places. Have you been to Kyoto? You most likely saw better ones. Unless you are a religious person they don't offer you much value. There are no English signs and all tourist groups are Japanese. The easiest one to see if just off Fukuoka by taking a half hour train to Togo and then a bus to the Hetsu-miya Shrine (Munakata Taisha actually). The bus will announce this in English. Ensure you know the bus schedule because the couple of buses that go here are very infrequent. If you want to see a bit more then take the bus all the way to the ferry port and take said ferry to Oshima Island. There is another similar Shrine but you also get to see some green island when hiking up the few minutes from the ferry stop. All in all I don't recommend this trip unless you have a car or want to spend more than half a day just seeing shrines. Taking the car to Oshima is expensive and gains nothing by the way. So here we have a new inscribed UNESCO with much cultural value but not much for tourists. Japanese garden: Hetsugu Shrine has Japanese garden surrounding its two sacred ponds. Silk Road: Okinoshima is on the maritime route that connect Japan with Mainland Asia. Many offerings come from silk road. Religious sites connected to fishermen: Local fishermen praying at the island shrine for safety and for bumper catches. Hiroshima Hotspot: the main shrine on Kyushu Island is easy to visit by bullet train via Kitakyushu and another local train. 13 Community Members have visited.